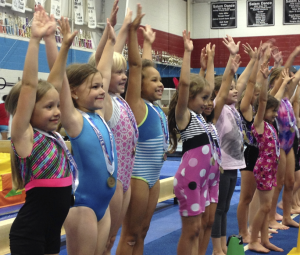 Experience the fun of a real gymnastics meet with an appreciative audience and lots of awards! Every child will go home with personal growth and awards to show off and parents will experience the joy of seeing their child strive to be the best they can be! Every Red Team & Blue Team girl is eligible to participate! Does your gymnast need a tutorial? View the 2019 Red Team & Blue Team Videos Here! * June 1 is Salem’s Gold Medal Day. Red & Blue gymnasts who do not compete in the Fun Meet may do their routines on Gold Medal Day.